HARLINGEN — A sloppy area of showers and low pressure east of the Yucatan Peninsula has about a 50-percent chance of developing into a more defined tropical system, National Hurricane Center forecasters said today. 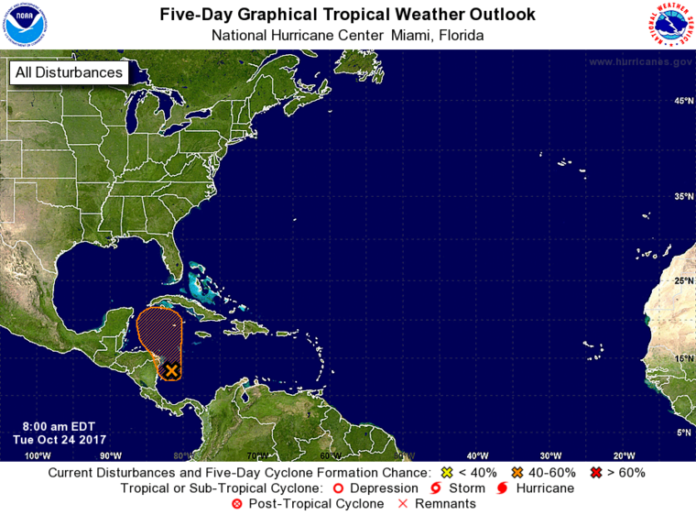 The area, referred to as Invest 93, is close to land in the western Caribbean which will slow development. But the general motion of the low pressure area is north toward the central Gulf of Mexico, at least at this time. For now, there is no threat to the Texas coast. High water temperatures south of Cuba and a moist atmosphere are conducive to tropical development, forecasters say. If the weather area develops and becomes a tropical system, it will be named Tropical Storm Philippe. The chance of formation into a more defined tropical system over the next 48 hours is low, at about 10 percent. However, over the course of the next five days, the area has a formation chance regarded as medium, or about 50 percent.